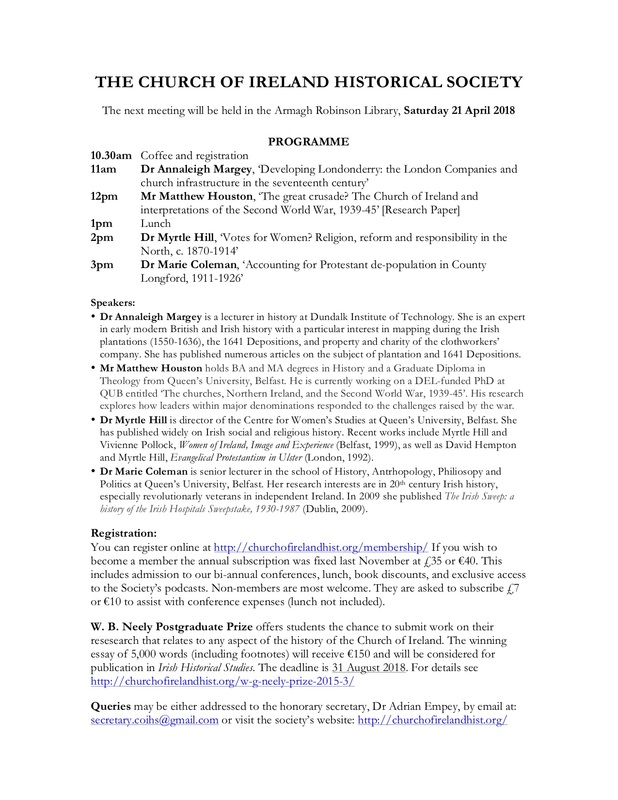 The Church of Ireland Historical Society’s first conference of the year will be on Saturday, 21 April 2018 in Armagh Robinson Library. The library is located at the northwest entrance gate to the Church of Ireland Cathedral. Tea and coffee will be served from 10.30am and the first paper will start at 11am. Confirmed speakers are Dr Annaleigh Margey (Dundalk IT), Dr Myrtle Hill (Queen’s University, Belfast), and Dr Marie Coleman (Queen’s University, Belfast). The research paper will be delivered by Mr Matthew Houston, who is pursuing his PhD at Queen’s University, Belfast. The conference is open to all members of the public. There is a daily fee of €10 (or £7) for non-members to assist with conference expenses, payable at the registration desk in the Music Room, but anyone can become a member for €40 (or £35). Those who join the Society but are unable to attend either of our conferences in Armagh or Christ Church Cathedral, Dublin (in November) will be given exclusive access to the podcasts which record these papers. For further details of our membership package please visit our membership page.